Last quilt of the year…coming soon! I’m well on my way to the toe on my second Fuzzy Feet felted slipper, then on to learning how to Kitchener stitch. But more importantly, I’m almost done with my last customer quilt of the year…and it’s GORGEOUS! Yes, I like the quilting design I’m putting on it, and yes, I picked something that took way longer than it probably needed to, but when I first saw this quilt…well, I fell in love. It’s just so peaceful. I love bright colors. I’m animated. I’m always on the go. This quilt is none of that. I’ll be finishing up the border tonight, while my husband is at work. As much as I’m dying to, I’m not going to post a sneak peak of the quilting, but you’ll know what I mean when you see it. More knitting projects…check out my Ravelry queue! Today, though, we need to go car shopping. Last week my husband’s 20 year old van broke down, the one he uses for his side jobs doing drywall. It’s been very enlightening having only one vehicle, and truly emphasizes the lack of bus service in Boise! I’ve drawn a line in the sand on spending anymore money for repairs; there’s over 194,000 miles on it! We’ve already put in more money than we should have, trying to get it to last until Spring. For the most part it’s been a good vehicle, but it’s time to replace it. Terrible timing, though. Oh, and my mom is coming to visit at the end of the week, after Christmas, so we’ll have our own celebration then. For those of you don’t celebrate Christmas, I hope you enjoy the festive atmosphere of this holiday season. For those of you who do, Merry Christmas! This entry was posted in knitting, Knitting Machine, Quilting, Sock Knitting and tagged knitting, knitting machine, Quilting. I’ve been trying to learn how to use the knitting machine that my cousin gave me. Of course, I don’t want to learn on my “good” yarn!…does anyone else do that? “Save” your “good” stuff for later? Some of the problem has been that I just haven’t really known what to make, and I don’t know what stitches to try to make said unknown project. It’s really a bit of a switch, changing my mindset from hand knitting, and even then I pretty much only make washcloths and scarves anyway! I am a quilter, after all. 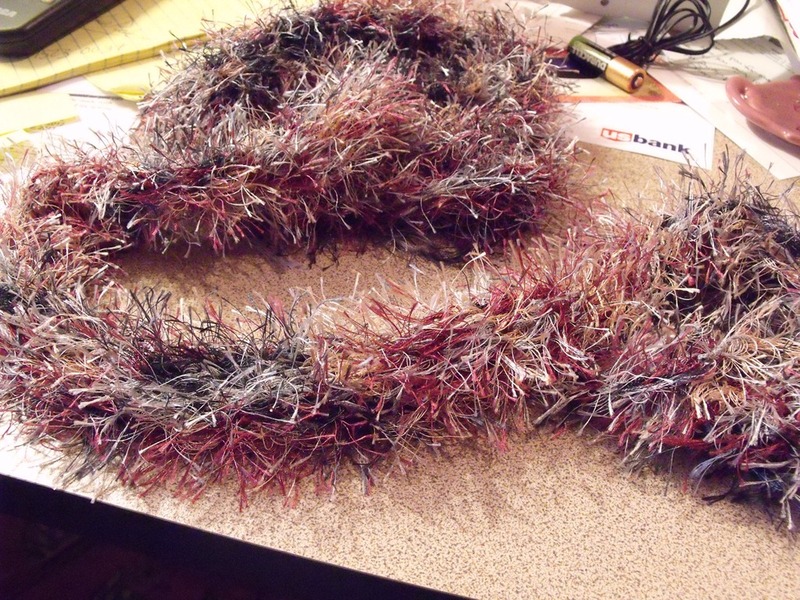 I’ve hand knit several long skinny scarves with the hairy novelty yarn, so I’ve been trying to use some of those in the knitting machine, too, and have had a hard time with them. One of my internet group suggestions was to run some “regular” yarn through the machine to make sure it is working properly. So, I went rummaging around my stash of yarn and found some Lion Brand Fun 100% acrylic yarn that I’d bought at a ridiculously cheap price a couple of years ago, when I thought I’d make a Bronco scarf or something and never got around to it. This hat is the result, and I’m thrilled with it! The light doesn’t do it justice, it’s really darling! I had no idea how big it would actually turn out to be, because I was experimenting, and it’s much too small for my small adult sized head, so I’ll give it to the church charity hat drive when I finish sewing up the side seam. One thing about making round objects on a flat knitting machine is that you have to seam most of them to complete them, and I’ve found that is my least favorite part. But I learned a lot on this project and had a blast doing it. 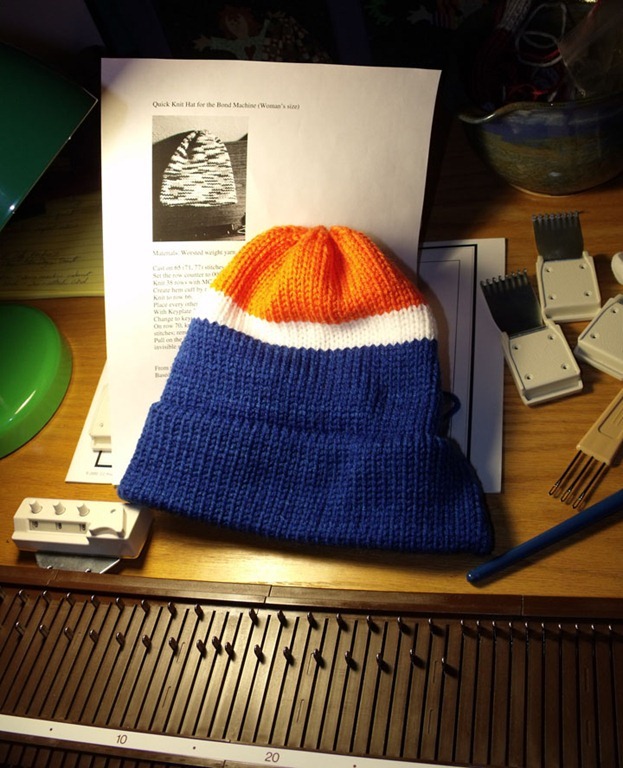 This entry was posted in knitting, Knitting Machine and tagged knitting, knitting machine. I just finished my first long skinny scarf using one skein of novelty yarn out of my stash. I used my Bond Ultimate Sweater Machine, which I’ve had forever, and took me just under an hour! That is, after the learning curve where I figured out how many needles to use and after I ripped it out the first time. The trick was using every other needle and going very slowly. I was afraid I’d run out of yarn before I got it cast off so I actually could have made a few more rows before ending, but that’s also part of the learning curve. I used 9 needles total, although I thought I had cast on more, but that was before I started over. I think I may sew this into an infinity scarf as it will wrap around my neck 3 times, which looks like a faux fur collar. I thought the weighted hem was really too heavy so I only used one weight bar on each side, and once it got long enough, I used my knees to support the weight. Again, I can’t stress “go slowly” enough! When it got really long I started using the claw weights. I had to rip back a few rows a couple times, which was the reminder to slow down. This entry was posted in Bond, knitting, Knitting Machine and tagged Bond, knitting, knitting machine.